Amazing amenities include Swimming pool, tennis, basketball, playground & sand volleyball courts MLS#2245669. 1126. Pemberley - WOOD TREAD stairs, hardwoods in master w/ tray ceiling, dual vanity, separate GARDEN TUB & oversized shower. Perfect, FLAT backyard. MLS#2246682. 1720. 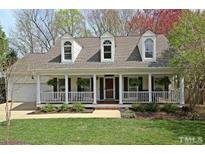 Ashley Downs - Summer is around the corner and this home has THE deck for entertaining! See you there! MLS#2246596. 5026. Holly Brook - Community pool, close to shopping & Hwy 1 access...**Verbally agreed upon, waiting for relocation signatures** MLS#2245798. 3836. Gorgeous screened porch and deck off the back will help you enjoy this private homesite! MLS#2246500. 3789. Seagroves Farm - Conveniently located to Highway 1 and Downtown Apex. MLS#2246379. 2731. Storage galore w/ walk-in attic space. Truly move-in ready! *WELCOME HOME* MLS#2246618. 5202. Convenient to hwy 64, 540 Ext, US 1. Wake county schools. MLS#2246591. 4532. Ashley Downs - The deck & brick patio overlook very private, level fenced in yard that backs up to woods. MLS#2246317. 2418. Popular neighborhood has pool, tennis courts & green spaces! MLS#2246336. 5204. Surrey Meadows - Enjoy the summer on a rocking chair front porch and gorgeous, sunny south facing backyard with a garden area, deck, and patio perfect for entertaining! MLS#2246505. 3447. Hollands Cove - Kitchen in 2018. Flooring and tile in 2019 MLS#2245493. 4793. Bella Casa - Sound insulation around all baths, laundry, powder Room. Still time to customize! MLS#2246241. 4508. 2 Car garage & covered carport Breezeway, fenced backyard, & Deck-beautiful backyard MLS#2243233. 1710. Whitehall - Easy access to the Greenway and located near Historic Downtown Apex.Only minutes from shops & restaurants. Documents available: https://whitehallvillage.wordpress.com/ MLS#2244579. 2848. Large master with tile shower, tub, dual vanities. MLS#2246278. 4532. Scots Laurel - Guest bedrooms on the 1st floor with full bath, hardwood flooring on the 1st floor (except the bedroom), Stainless Steel appliances, fireplace, game room/den/office on 2nd floor, large master bedroom with large closet and master bath..this home has it all ! MLS#2246242. 695. Sunset Hills - This Is One You Don't Want To Miss! MLS#2246051. 4623. 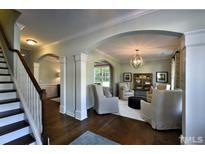 Family Room: CffrdCeilng, TileSrrnd Fireplace, RcssdLghts & Built-ins! 3rdFlr WlkUpAttic! MLS#2246060. 1128. Bonus room on second floor. Move in this summer! MLS#2246009. 4692. Amazing Calhoun home plan pre-sale! MLS#2245977. 639.